SCHERER -Utrivso Tartariae & Insularum Indicaru. SCHERER, H. - Utrivso Tartariae & Insularum Indicaru. Utrivso Tartariae & Insularum Indicaru. 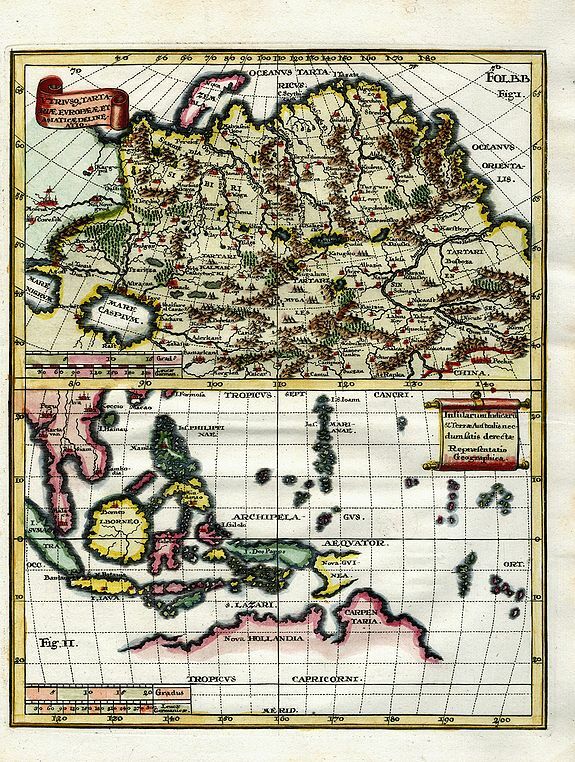 - SCHERER, H.
Title : Utrivso Tartariae & Insularum Indicaru..
Map maker : SCHERER, H.. Size : 9.2 x 7.2 inches. / 23.4 x 18.4 cm. Description :Two maps on one sheet. The one on top showing northern Russia in great detail, with many mountains, woods, rivers, and towns shown. The map on the bottom shows Indonesia and the northern part of Australia. With curiously shaped islands and New Guinea only partially discovered. Two early and uncommon maps! Condition : Very good condition. Only faint toning. Tight margin on the right side.